H.A.R.R.P considered as New Arm of Armageddon of DOOM’s day as men play God? Decades have passed since HAARP has been suspected being responsible and an instrument of Armageddon bringing all recent earth quakes, floods, forest fires, drought that our planet is enduring. While others put the responsibility on the coming Doom’s day effect which will culminate on 2012 at the end of Maya calendar cycle. The Ecologists put the main culprit being pollution caused by excessive use of fossil fuel all over the world. The religious leaders claimed a sign of the end of the time as prophesied, when men play as God. These days’ voices have been raised against the installation of HAARP even among some political leaders. Most of the denunciation of the HAARP comes from some people one way or another worked in and around the project. 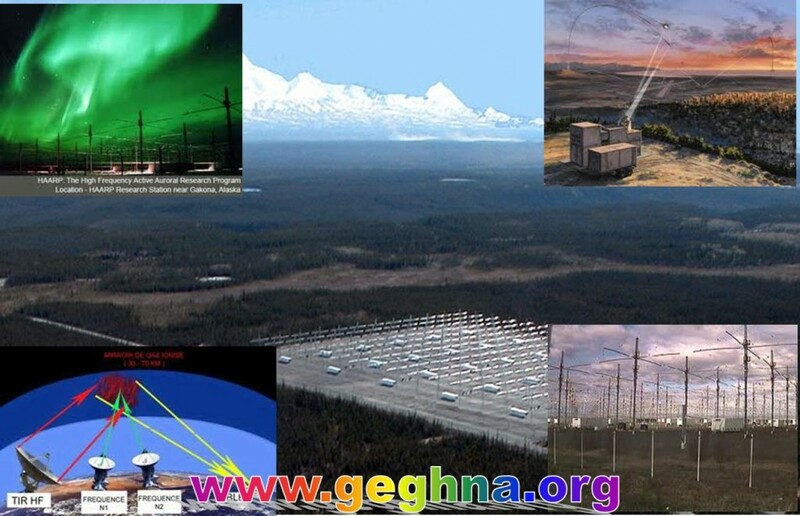 HAARP The High frequency Active Auroral Research Program (HAARP) is a program focused on the study of upper atmospheric and solar-terrestrial physics and Radio Science. It has been there since the 1950s to investigating the fundamental physical principles which govern the earth’s ionosphere. Brabcheces are found in Puerto Rico, near the Arecibo Observatory, and the other (known as HIPAS) in Alaska near Fairbanks. The European Incoherent Scatter Radar site (EISCAT), a premier ionosphere research facility located in northern Norway near Tromso the offspring of HARRP. It has some reflect factlties all around the earth Jicamarca, Peru; near Moscow, Nizhny Novgorod (“SURA”) and Apatity, Russia; near Kharkov, Ukraine and in Dushanbe, Tadzhikistan. The Ionospheric Research Instrument (IRI), a high power transmitter facility operating in the High Frequency (HF) range. The IRI will be used to temporarily excite a limited area of the ionosphere for scientific study. A sophisticated suite of scientific (or diagnostic) instruments that will be used to observe the physical processes that occur in the excited region. HAARP is composed of power, high-frequency (HF) phased array radio transmitter (known as the Ionosphere Research Instrument (IRI), used to stimulate ionosphere, geophysical research instruments including an HF ionosonde, ELF and VLF receivers, magnetometers, riometers, a UHF diagnostic radar and optical and infrared spectrometers and cameras which are used to observe the complex natural variations as well as to detect artificial effects produced by the IRI. HARRP is a big big capacitor whcih only stores and releases electrical energy, without dissipating any. In reality, all capacitors have imperfections within the capacitor’s material that create resistance. Men through centuries were trying to harness energy similar to the Ark of covenant. Th king of o kings of Ethiopia Menilk the II used the holy Ark to bit the invading Italian troops in 1896 at the hills of Adwa . The Biblical account relates that during the trip of the Israelites, the Ark was carried by the priests ~2,000 cubits (Numbers 35:5; Joshua 4:5) in advance of the people and their army or host (Num. 4:5-6; 10:33-36; Psalms 68:1; 132:8). When the Ark was borne by priests into the bed of the Jordan, the river was separated, opening a pathway for the whole of the host to pass over (Josh. 3:15-16; 4:7-18). The Ark was borne in a seven day procession around the wall of Jericho by three priests sounding seven trumpets of rams’ horns, the city taken with a shout (Josh. 6:4-20). When carried, the Ark was always wrapped in a veil, in tachash skins (the identity of this animal is uncertain), and a blue cloth, and was carefully concealed, even from the eyes of the Levites who carried it. HARRP is like a man made Ark which is made to control nature. According to the its institute HARRP to ensure the safety of all flight operations in the vicinity of HAARP, the facility employs an aircraft alert radar (AAR) to automatically shut off appropriate transmissions when aircraft are detected either within or approaching a defined safety zone around the facility. Flight tests are conducted regularly to demonstrate the capability of the HAARP radar to detect even very small targets. Research operations are not conducted unless the AAR is operating satisfactorily. CLG says U.S.’s HARRP Program Responsible for the Chili ..
Is HARRP hazardous to our health? The Africom US’s Military Support for Africa …Why? The US is forced to put its new Africa Command in Germany for now,only Liberia, offered to host it. Most African countries are scared considering it as a new colonization of the US by militarization the continent, since it has been only half a century they came out of brutal colonization. The us military command was created to unite responsibilities shared by three other US regional commands. According to the US the key aim of Africom was to build the capacity of African countries for security and peacekeeping. theAfricans doubt the US intentions as they felt a lose of the hard won national sovereignty. As the US Africa Command (AFRICOM) force becomes ever more active in Somalia, questions must be raised as to the intentions of this militarised organisation, writes Explo Nani-Kofi. Nani-Kofi stresses that the African continent grows ever more vulnerable to a maturing breed of neocolonial occupation based on US-led proxy wars. When Barack Obama was elected president of the US, it was supposed to be the end of the bad old days of George W. Bush. But in Somalia, the ‘war on terror’ continues. March this year saw the start of a new US operation in support of the transitional government in Somalia. According to the New York Times, American advisors had spent the last several months training Somali forces to be deployed in the offensive against factions of the Union of Islamic Courts movement, and the US had provided ‘covert training to Somali intelligence officers, logistical support to the peacekeepers, fuel for the maneuvers, surveillance information about insurgent positions and money for bullets and guns’. This was something of a covert operation from the US point of view. A US official, who told the paper ‘what you’re likely to see is air strikes and Special Ops moving in, hitting and getting out’, said he was not allowed to speak publicly about it. On 2 May, explosions in a mosque in Mogadishu’s Bakara market, a stronghold of the US-targeted Al Shabaab group, killed 45 people and triggered fighting between a pro-government militia and Al Shabaab and Hizbal al Islam, both factions of the Union of Islamic Courts movement. It’s not clear who actually set off the explosions, but it is beginning to seem that Somalia could be the US Africa Command’s (AFRICOM) first overt war. 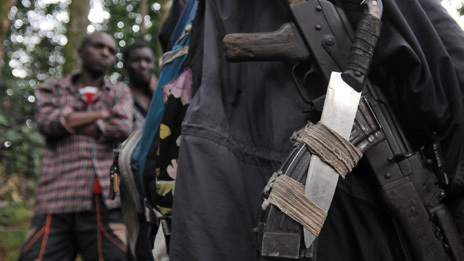 The Obama administration’s 2011 budget request for security assistance programmes in Africa includes $38 million for arms sales to African states, $21 million for training African officers and $24 million for anti-terrorism programmes. This is in addition to the 40 tonnes of arms and ammunition supplied to the Somali transitional government in 2009, and military aid to Ethiopia, which fronted for the US in the fight against the Union of Islamic Courts in 2006. AFRICOM has now taken over US security assistance programmes with Mali, Niger, Chad and Senegal, and the Defense Department is now considering forming a 1,000-strong marine rapid deployment force for Africa. Although AFRICOM gives the impression it is not a combat force, it looks as if this may change. The justification for US involvement in Somalia is ‘Islamic extremism’. Al Shabaab is on the US list of terrorist organisations as a supposed part of al-Qaeda. On 14 March, General William (‘Kip’) Ward, commander of AFRICOM, singled out Somalia in testimony before the Senate Armed Services Committee as the east African country most ‘threatened by terrorists’, while Senator Carl Levin stated that ‘al Qaeda and violent extremists who share their ideology are not just located in the Afghanistan-Pakistan region but in places like Somalia, Mali, Nigeria and Niger’. Kip Ward also spoke of support for the Somali government, which is being fought against by radical Islamist groups, as a responsibility that the US has to take up. This means that there is no separation between the US–UK presence in Afghanistan and AFRICOM’s operations in Somalia and other parts of Africa. AFRICOM, responsible for US military operations for the whole of the African continent except Egypt, was established in October 2008, but the idea goes back to the beginning of the decade, when the US National Intelligence Council estimated that the US will buy 25 per cent of its oil from Africa by 2015. Oil and natural gas seems to always sit nicely with this so-called war on terror. The case of Somalia epitomises the proxy war situation in Africa and also smashes some of the myths around why African countries are in the situation they are. It’s sometimes argued that the different languages and tribes in many African countries are the cause of their problems. However, Somalia is one country with one language and one dominant religion, so by that reasoning it should have more internal harmony than its neighbours. The explanation for its problems lies in the history of colonialism and exploitation by Western powers. 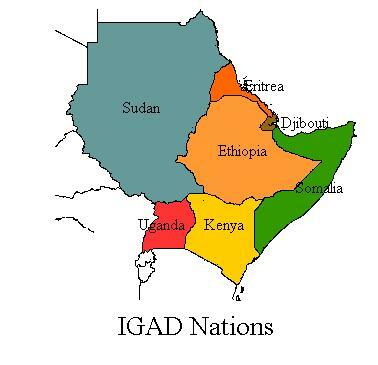 The breakdown of national cohesion in Somalia and the civil war in 1988, since when the country has been ungovernable from Mogadishu, was caused by its use in the Cold War and specifically by President Siad Barre’s decision to seek alliances with the US and apartheid South Africa against Soviet Union-backed Ethiopia. Subsequent international interventions, like the UN force in 1992 and the Ethiopian US-backed invasion in 2006 have been more about occupation than mediation. The US proxy war in Africa is a mechanism to re-colonise the continent and extend the boundaries of the war on terror. It’s time to mobilise against it. To support the campaign against AFRICOM and the proxy situation in Africa, check the Sons and daughters of Africa Movement Facebook page, coordinated in Europe by Agnes Munyi-Vanselow and Explo Nani-Kofi of KILOMBO – Campaigning Against Proxy War Situation in Africa and AFRICOM. The latter is affiliated with the Stop the War Coalition in the UK. Over 43 people have been killed in the Somali capital of Mogadishu in the past two days in fighting between Shabab (al-Shabaab) insurgent forces, who on March 10 advanced to within one mile of the nation’s presidential palace, and troops of the U.S.-backed Transitional Federal Government. The fighting has just begun. He answered it in stating “Part of the reason is because the United States has its only base in Africa up the coast from Mogadishu, in Djibouti, the former French Somaliland. The U.S. Africa Command was established there in 2008, and, absent the willingness of other African countries to host it, the base in Djibouti became the headquarters for U.S. troops and fighter bombers in Africa. 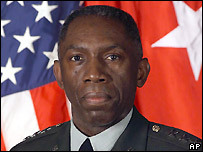 Four days later General William (“Kip”) Ward, commander of United States Africa Command (AFRICOM), testified before the Senate Armed Services Committee. Senator Levin and General Ward included eight African nations in the broader Afghan war category of Operation Enduring Freedom, countries from the far northeast of the continent (the Horn of Africa) to the far west (the oil-rich Gulf of Guinea). The U.S. military has already been involved in counterinsurgency operations in Mali and Niger against ethnic Tuareg rebels, who have no conceivable ties to al-Qaeda, not that one would know that from Levin’s comments. Strong enough or not, that is just what the White House and the Pentagon are doing. The only other objection that can be raised to the above author’s description is that it too severely narrows the intended battlefront. Last October the U.S. led ten days of military exercises in Uganda – Natural Fire 10 – with 450 American troops and over 550 from Burundi, Kenya, Rwanda, Tanzania and Uganda. The U.S. soldiers were deployed from Camp Lemonier (Lemonnier) in Djibouti, home to the Pentagon’s Joint Task Force/Horn of Africa and over 2,000 U.S. forces. The de facto headquarters of AFRICOM. Emerging energy interests in Uganda’s Lake Albert Basin. Washington’s North Atlantic Treaty Organization allies are also deeply involved in the militarization of East Africa. NATO Secretary General Anders Fogh Rasmussen recently returned from Jordan and the Persian Gulf state of Bahrain where he pressured both nations to support the war in Afghanistan and Alliance naval operations. While in Jordan he was strengthening military ties with NATO’s Mediterranean Dialogue partnership – Algeria, Egypt, Israel, Jordan, Mauritania, Morocco and Tunisia – and in Bahrain firming up the Istanbul Cooperation Initiative aimed at the six members of the Gulf Cooperation Council: Bahrain, Kuwait, Oman, Qatar, Saudi Arabia and the United Arab Emirates. Bahrain, Egypt, Jordan and the United Arab Emirates have military personnel serving under NATO in Afghanistan. In late February a delegation of the 53-nation African Union (AU) visited NATO’s Supreme Headquarters Allied Powers Europe in Mons, Belgium. On March 10 AMISON deployed tanks to prevent the capture of the Somali presidential palace by rebels. In May the European Union, whose membership largely overlaps with that of NATO and which is engaged in intense integration with the military bloc on a global scale22 will begin training 2,000 Somali troops in Uganda. The 2,000 soldiers to be trained by the EU will represent a full third of a projected 6,000-troop Somali army. As though Somali al-Shabaab fighters have nothing else to do as the U.S. is engineering an all-out assault on them in their homeland. Five days after the New York Times feature detailed American war plans in Somalia, the Washington Times followed up on and added to that report. The campaign has already begun. In Ethiopia the Historical over thousand of years Zege Church burned recently by the regime No body moved a finger. The Great Buganda people has just declared revolution while the Ethiopians are sleeping . The Ethiopians must learn from Uganda and defend their cultural identity. Imagine a Mosque is just touched what will happen? Where is the justice…? Where are the defender of international cultural Identity ? Where are the so called Christan world ? Specially The orthodox World Russia , Greek 8 Eastern Churhes etc… Where are our brothers the Muslims defender of a true faith no word in their site about this great church ? Where is our ecumenism. Where is UNESCO in Ethiopia ? The Buganda kings like Toree’s kings claim their descendants from Ethiopian Kings they gave the name to the country what is called today the post colonial Uganda. Uganda is off time konwn as the Perle of Africa. Buganda is a kingdom located on Lake Victoria; Over time it expanded by means of conquest; in the 19th century it covered a large part of what is Uganda today, including the site which was to become Uganda’s capital, Kampala. It has an old relation with the Abyssinian kingdom. 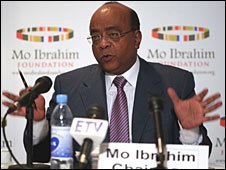 it was interpreted by the Scramble of Africa and the coming of the European powers in the region. In the 19th century, Buganda was visited by western travelers : J.H. SPEKE (1862), HENRY MORTON STANLEY (1876). Their reports picture a state of considerable size and authority, the capital at LUBAGA HILL a town of 40,000, the armed forces consisting of 125,000 troops and a ‘navy’ of 230 war canoes. Anglican missionaries arrived in 1877; Catholic missionaries in 1879; soon, protestant (Anglican), catholic and islamic groups intrigued against each other at Buganda’s court. Clashes between rival factions resulted in massacres; as political leaders frequently changed, so did the victimized communities; in 1885, Kabaka Mwanga ordered the execution of 1 Anglican missionary and of 30 Catholic converts.. The Tombs of Buganda Kings at Kasubi constitute a site embracing almost 30 ha of hillside within Kampala district. Most of the site is agricultural, farmed by traditional methods. At its core on the hilltop is the former palace of the Kabakas of Buganda, built in 1882 and converted into the royal burial ground in 1884. Four royal tombs now lie within the Muzibu Azaala Mpanga, the main building, which is circular and surmounted by a dome. It is a major example of an architectural achievement in organic materials, principally wood, thatch, reed, wattle and daub. The site’s main significance lies, however, in its intangible values of belief, spirituality, continuity and identity. Criterion i The Kasubi Tombs site is a masterpiece of human creativity both in its conception and its execution. Criterion iii The Kasubi Tombs site bears eloquent witness to the living cultural traditions of the Baganda. Criterion iv The spatial organization of the Kasubi Tombs site represents the best extant example of a Baganda palace/architectural ensemble. Built in the finest traditions of Ganda architecture and palace design, it reflects technical achievements developed over many centuries. Criterion vi The built and natural elements of the Kasubi Tombs site are charged with historical, traditional, and spiritual values. It is a major spiritual centre for the Baganda and is the most active religious place in the kingdom. 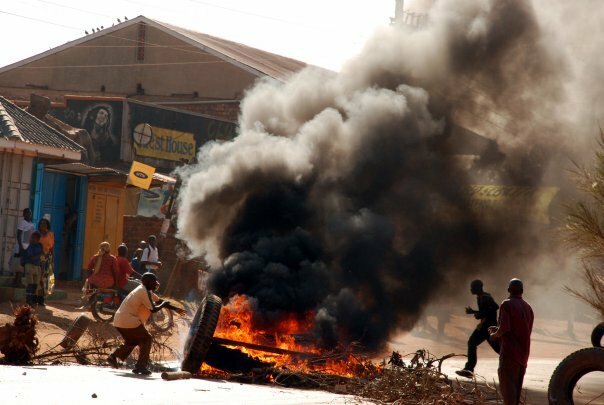 Thousands of people in Uganda belonging to the Baganda kingdom have held a riot at the tombs of their late kings, which caught fire last night. The grass thatched building which contained the five tombs of late kings, all the kings to have ruled Buganda kingdom in the last 100 years, caught fire last night. According to a police officer at a police post near the tombs, Chris Sali, the tombs caught fire at 8.30 but there are different versions about the cause of fire. “Some people say that they saw someone setting fire on the tombs. They say he fled in a vehicle. Others say that young men who smoke opium near the tombs were responsible for setting the fire on the tombs,” Sali said. Meanwhile, some people in the Buganda kingdom have accused the Ugandan government of setting the fire on the tombs. The government has vehemently denied the allegations. Thousands of angry people stormed the tombs after the fire and started mourning. They fought with the police who had been deployed to contain law and order. Four people have been admitted to hospital (Mulago) in Kampala after having sustained severe injuries. 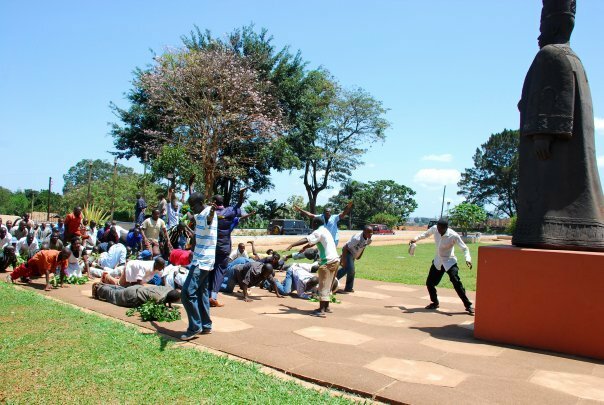 The angry mob blocked Uganda’s president, Yoweri Kaguta Museveni from visiting the tombs. The President later canceled his visit. Although President Yoweri Museveni restored Ugandan Kingdoms in 1993 — albeit establishing them as non-political cultural institutions — after they were abolished in 1967 by President Obote, the Baganda believe that the President has tried to limit the influence of the Buganda Kabaka (King). 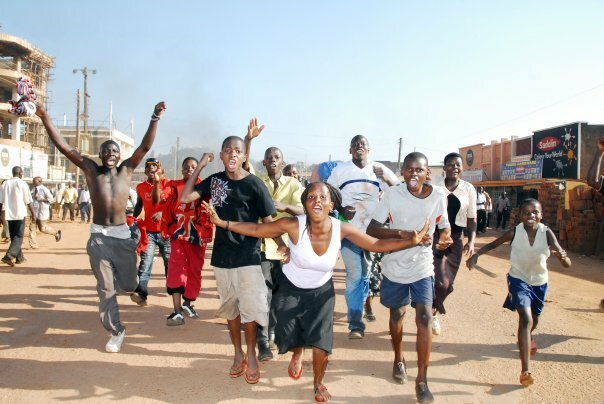 Last September, clashes erupted in the Ugandan capital, Kampala, following a planned visit by King Ronald Muwenda Mutebi of the Buganda kingdom to the central district of Kayunga. About 20 people were killed. Kayunga, which is part of the Buganda kingdom, is believed to be inhabited by mostly non-Baganda. The riots were sparked when the minority community in the largely Buganda populated area opposed the King’s trip. The Kayungas who opposed the visit of the King said they had seceded from the Buganda Kingdom, while insisting that the Kabaka’s visit was politically motivated. A detail that is prohibited by the 1993 deal that restored the kingdoms. 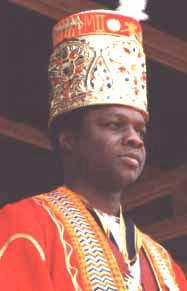 The Baganda have been advocating for constitutional powers for Kings through the restoration of a federal administration that would formally recognize the political power of their King. Buganda is the largest and most politically powerful kingdom with about 20 per cent of the total Ugandan population and constituting the largest single ethnic group in the country. The Kingdom is strategically located in the central region along the shores of Lake Victoria and houses the nation’s capital, Kampala. 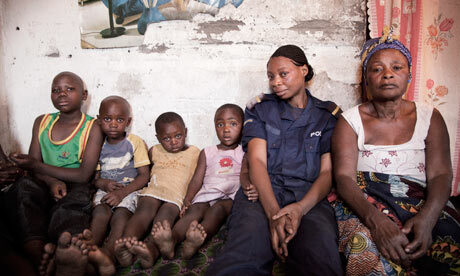 The Baganda have an estimated population of about five million people. During the colonial era, Buganda became the most influential kingdom in Uganda when the British rewarded it for its collaboration by giving it territories that belonged to the western kingdom of Bunyoro. Many Baganda have, for several years, unsuccessfully lobbied the government to introduce a federal form of government that would give some autonomy to the regions. Who burnt the Kasubi Tombs? The royal Buganda tombs at Kasubi on July 19, 2009. The Buganda royal site, the Tombs at Kasubi, have been razed to the ground in a fire that swept through the premises shortly after 9:00p.m. on Tuesday night, March 16, 2010. Witnesses at the scene at the time of the fire said it had started without warning or build up and appears to have been the work of an arsonist. 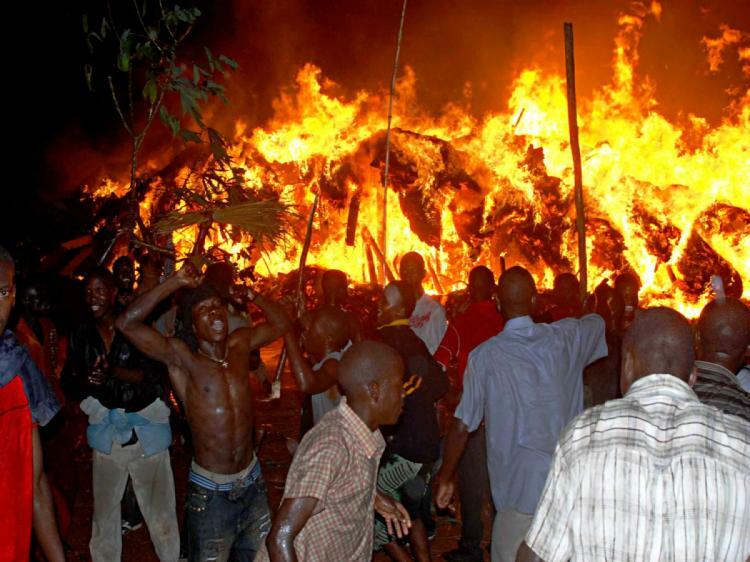 Hundreds of distressed and wailing Baganda gathered at the burning building and tried desperately to extinguish the fire but were reduced to tears and helplessly watching the grass-thatched complex go up in flames. When the police arrived, it too failed to put out the fire and when the crowd got rowdy, gunshots and teargas were fired in the air, further angering the crowd. WBS television and NTV aired segments of the inferno, while NBS television and Record TV run extensive video footage of the scenes of chaos, anger and the burning premises. As gleaned from the TV footage, the anger of the crowd gathered at the tombs appeared to be directed at President Museveni, with many voices caught on camera angrily declaring that no matter what, one day he would perish in a fire too. SMS text messages flying about in Kampala mentioned the fire and usually pointed the finger at Museveni. The Katikiiro of Buganda, J.B. Walusimbi, Prince Kassim Nakibinge, and Buganda Information minister Medard S. Lubega were among the senior kingdom officials first at the scene. The tombs, listed as one of hundreds of World Heritage Sites by the United Nations cultural agency UNESCO, were one of the most visited historic sites in Uganda. Built just over 100 years ago, they are the traditional burial ground of Buganda’s kings, as well as the repository of some of the most valuable and irreplaceable cultural artifacts in Buganda. Who set the royal tombs on fire? The Daily Monitor newspaper, in its edition of Wednesday March 17, 2010, quoted eye witnesses as saying that a white pickup without number plates was at the scene. A woman spoke of seeing a white box left at the tombs, then a loud explosion just before the historic site burst into flames. When nearby motorcycle riders tried to block the pickup, now speeding off the scene, somebody inside or seated on the outside of the vehicle fired in the air to disperse the motorcycle riders. “[T]he fleeing man shot in the air to scare away riders in his pursuit,” the Daily Monitor reported. This, clearly, was an act of arson and sabotage. Whoever lit that fire knows what the Kasubi Tombs mean to Buganda. It is like setting fire to the Tomb of the Unknown Soldier at Westminster Abbey in London, historic burial site of some of England’s most revered figures. The purpose of burning Kasubi Tombs would have been two fold. 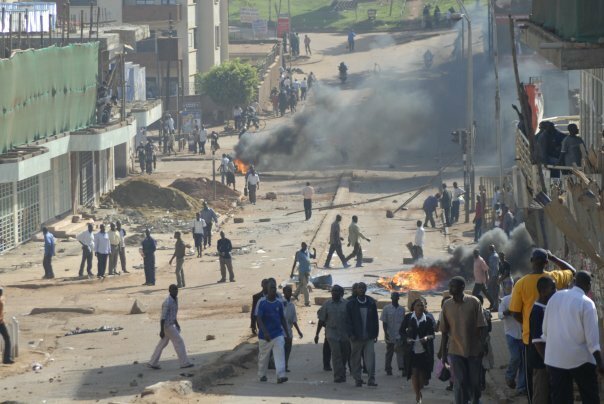 From the point of view of one trying to cause the Museveni government to lose any remaining support in Buganda, it would have been to trigger off riots or deep and boiling anger among the Baganda. From the point of view of a state actor, to set the tombs on fire and destroy them would achieve the goal of creating conditions of such unrest and insecurity as to warrant the proclamation of a state of emergency in Buganda. Whatever the truth, this was an act of supreme political sabotage, not mere arson. The only act that would exceed this would be to assassinate the Kabaka of Buganda or to burn down one of his palaces. The fact of a loud explosion preceding the break out of a fire was the hallmark of the fires that struck Budo Junior School and several others schools in and outside Kampala in 2008 and the Park Yard Market near Nakivubo Stadium in 2009. Explosives were used. What makes the Kasubi fire even more suspicious was the reported firing in the air by the getaway car. Had the tombs been set on fire by an ordinary arsonist, he would have made it his top priority to flee the scene as quietly and inconspicuously as possible. To fire gunshots in the air could only attract attention. More importantly, to have the audacity to fire gunshots in the air suggests the confidence of an arsonist with some measure of state protection, or membership in the official state security and military apparatus. In its reporting and discussion of the fire on Wednesday morning, NBS television kept receiving SMS text messages from viewers mentioning their belief that it was the government. As the fire raged on Tuesday night, the Catholic Church-run radio station, Radio Maria, kept receiving phone calls by listeners accusing the government of being behind the fire and had to discontinue the discussion for fear of being accused of inciting the public. It was noticeable, on Wednesday morning, that most FM radio stations in Kampala avoided discussing the fire during their breakfast shows, mindful of what live phone calls from listeners would say and knowing the risk they run in having their operating licenses withdrawn. The caution taken by the radio stations not to discuss the fire in itself reflects the widespread anger among the public and their belief that this was a state-orchestrated attack on Buganda.